Eyelid margin disease is a common and persistent inflammation of the eyelids. This condition frequently occurs in people who have a tendency towards oily skin, dandruff or dry eyes. With blepharitis, both the upper and lower eyelids become coated with oily particles and bacteria near the base of the eyelashes. It may cause irritation, itchiness, redness, and stinging or burning of the eye. Conjunctivitis is most commonly referred to as red or “pink” eye. 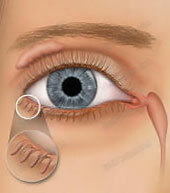 The conjunctiva, which contains tiny blood vessels, produces mucus to coat and lubricate the surface of your eye. When the conjunctiva becomes irritated or inflamed, the blood vessels become larger and more prominent, making your eye appear red. Conjunctivitis may occur in one or both eyes. Generally, conjunctivitis is easily treated. However, if symptoms of conjunctivitis persist for an extended period of time after treatment, you should have your eyes examined by your ophthalmologist, as these symptoms may indicate a more serious eye problem. There are several eye diseases that cause red eyes, some of which can lead to blindness unless diagnosed and treated.